Teething is a natural process that occurs when primary (baby) teeth emerge through the gums. Unfortunately, the process isn’t always comfortable. In fact, teething can be especially hard on babies as well as the parents who are trying to console them. Tender gums can make it difficult to both eat and sleep, which are two things we know babies need to be happy. For most babies, teething begins around 4 months of age and can last up to 16 months. 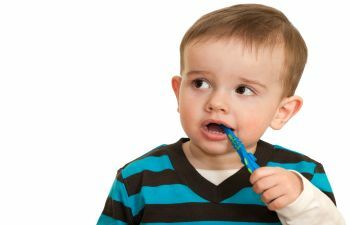 While your baby may handle teething like a pro, it can be helpful to know what to expect, including the general timeline of teeth eruption and the typical symptoms that may accompany this process. You can expect your baby to follow an average timeline for teething. In most cases, your child’s primary teeth will fall out in the order they emerged. Likewise, if your child was early to get teeth, they will likely be one of the first of their classmates to lose a tooth. 4-6 Months: Your baby’s teeth are?almost ready to emerge. Swollen gums are common?as teeth begin to push through. 6-10 Months: The first teeth arrive (lower central incisors). They are typically the most painful! 8-12 Months: The 2 upper central incisors appear. 9-16 Months: The lateral incisors mark the end of painful teething. A full set of teeth should arrive by age 3. Now to the important part – what can you do to soothe a teething baby? It is no longer recommended that topical anesthetic gels be used on a baby’s gums. Instead, parents are urged to try other methods such as store-bought teething tools, pacifiers or simply a refrigerated baby spoon. At Georgia Orthodontics & Children’s Dentistry, we are happy to help you with your child’s dental health at every stage, which includes addressing swollen, painful and teething gums in babies. Most importantly, remember that once you notice that first tooth pop through the gum line, it is time to schedule your baby’s first dental visit!